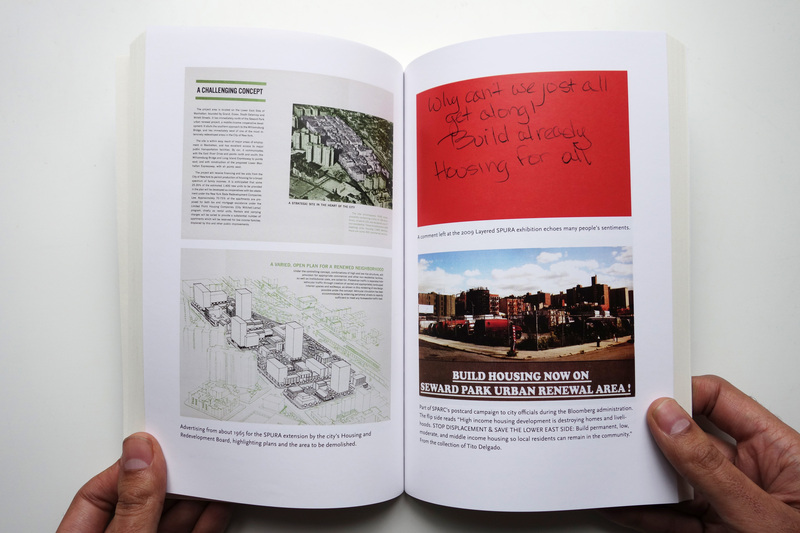 Contested City: Art and Public History as Mediation at New York’s Seward Park Urban Renewal Area, a new book by Gabrielle Bendiner-Viani, charts the long, dispiriting, and complicated history of the Seward Park Urban Renewal Area (SPURA) on the Lower East Side of New York. Over five years, Bendiner-Viani walked the neighborhood, bringing along students from The New School, with an eye toward how residents, activists, artists, and city planners could spur new modes of interaction and mediation. The result is an eye-opening view of both a part of the city that is often overlooked, the presence — and haunting — of the past, and captivating ways to take action: by walking, talking, making, and returning. Join us at the book launch of Contested City on February 12, 7-9pm. It is free and open to the public. RSVP here. Julia Foulkes [JF]: Over the last fifty years SPURA has gone from disinvestment — a stalled urban renewal project — to gentrification but with a heated debate about affordable housing at its center. How does affordable housing reveal what is at stake in this larger transformation of the neighborhood and the city? Gabrielle Bendiner-Viani [GB-V]: Part of why I think SPURA is so important to understand is that even though its history is extreme, the issues at play are shared in many other cities and neighborhoods. At SPURA people have fought over who is the “authentic” Lower East Side, and who should be able to determine its future. At the heart of this has often been a highly racialized idea of whose families matter, who should succeed, and a concept that there is a zero sum game, in which if people of color win, white people lose. This is of course a fallacy, but if we scratch the surface, this idea informs many parts of our society even now. It’s certainly at play in national politics. The local and citywide fights over affordable housing, and the future of our public housing, also point to big questions about what and who we think the city is for. When the basic notion of housing as a human right seems laughable in public discourse — at the local and national levels, in cities and rural places — and it is tacitly accepted that homes are actually real estate, created with the express purpose of profit rather than being inhabited for a lifetime, it is clear that we’re making decisions that see the city as a place for storing capital, rather than as a place for people’s lives. JF: You have a unique set of skills and experiences — an artist with deep knowledge of design; a scholar with a doctorate in environmental psychology; an activist with community organizations; and a life-long New Yorker. They all seem to be part of what you call “visual urbanism.” Could you explain this approach to understanding and acting in the city? GB-V: You could say that visual urbanism is the term I coined to explain to other people how all my jobs and life experiences make sense in my own head as interwoven parts of one commitment to understanding people and the meaning that places hold for them. It is also a way of working that argues that creative practices can be a way of knowing, belonging as part of urban research because they help us pose questions we might not otherwise know to ask. For me, this practice is also one that struggles against the often-uneasy relationship between text and image, and between imagination and fact. I am trying to create spaces, projects, and research where these ways of knowing are equal: the text does not caption an image, the image does not illustrate a text. Images, words, feelings, and histories are experienced together, each bringing a new facet of understanding or new voice to a conversation. I’m interested in this work as something that can act in the world, that can build on the accessibility of images to spur conversations and action in our complicated cities, neighborhoods, and homes. Finally, I coined the term as a way to build community for others I saw working in this way — these were colleagues and students often feeling that they were at the edges of their own disciplines, as I often have been. I wanted to name this intersection so that a periphery could become a center and make space for a meaningful cross-disciplinary dialogue, in conferences I’ve curated — like the Urban Encounters series I started at the Tate Britain — and in classes I teach at the New School. JF: Your intention in engaging neighborhood residents, activists, and politicians in conversation together was not to create a vision of what the empty lots should be or look like. Why? GB-V: Quite simply, I didn’t feel that that was our job. It seemed clear to me that to propose a solution for the parking lots, as though no one had ever done so, or just hadn’t had a good enough idea, in the intervening forty years since the area’s demolition, was both arrogant and missing the point. SPURA didn’t stay empty because no one knew what to do with it. It stayed empty because of structural racism and political corruption. I thought that any decision about what should be at the site should come from the neighborhood itself and would have to come from negotiations amongst the many communities there. It seemed that the best way we could support those conversations was to value SPURA itself as a place which had a history, meanings, and a future, complicating the efforts of some to talk about it as only a certain amount of square footage. The arts and humanities, or visual urbanist, approach that we took was a way to make accessible and public the idea of SPURA as a place, recognizing that solutions aren’t usually what’s necessary as a first step, but rather that building the capacity to have the conversations, and to see each other as people, is what needs to happen first. The photographs, oral histories, maps, soundscapes, and other media in our exhibitions helped ground the conversations had within the exhibition spaces in past and present experience and in a people’s history of the neighborhood. JF: Artists, art institutions, and funders have flocked to the collaborative art-making processes you developed in your involvement in the Seward Park neighborhood. What have you learned about this field of “social practice,” as it has come to be known? GB-V: A few years ago I had a funny moment when someone was describing another project to me, and they said “it’s social practice, like your work.” And I thought, oh, it has a name?! It’s funny about naming things. Sometimes it brings the power to organize and advocate, and sometimes it reifies things, hardening them, and the most salient points aren’t always what come out on top. I have a chapter in the book called “Three Words: Community, Collaboration, and Public,” and I’ve found that deeply understanding and thinking critically about what those words mean, and how they’re neither simple nor agreed upon, is crucially important to this work called social practice, as well as to the related genres in other fields — for example, social design and civic engagement. There’s too often a simplification of “community,” which in my experience is neither simple nor unified, and there can be issues with building long-term and truly equitable partnerships. Sometimes these practices are incredible. At other times, they forget the most basic tenet of building relationships (in life, work, neighborhood, anywhere) which is that of building trust, and what kinds of risks, respect, and time it takes to do that. JF: Students played a large role in the project over many years and they are compelling analysts throughout the book. The New School itself, though, seemed to hinder more than help the project. How might universities better support this kind of work? GB-V: There’s a doozy of a final question! There are many practical things to consider here, but the biggest underlying issues are time and power. In building community-based collaborations, uneven power dynamics are always present. For example, while an individual faculty member might not have a lot of power, they’re often part of an institution that may not always have acted in the interest of the community being partnered with. That power comes with them, whether they like it or not. Faculty members might advocate for their students, but sometimes this is to the detriment of a partner if the university or project isn’t paying, or otherwise remunerating, that partner for doing what is essentially co-teaching our students. Uneven power is also present in which faculty often teach these kinds of classes: these are often part-time and contingent faculty who are not paid extra for the hours out of class time it takes to build a partnership. Time is also an issue, in part to build the trust mentioned above. Trust takes time, time outside of classes, and time often beyond the constraints of a semester. These kinds of classes would benefit greatly from year-long or other longer-term models, in which students can be adequately prepared for collaborative work in the earlier parts of a class, and then hone their ways of working with a partner, and finally have the time to make something fully evolved by the end. Partners too need to know that faculty and students can be around for the longer term, rather than dropping in for a few months. Many faculty do build these long-term partnerships, but this is usually through their own commitment, rather than through a support system of the university. Purchase a copy of Contested City: Art and Public History as Mediation at New York’s Seward Park Urban Renewal Area on Amazon here or on the University of Iowa Press website here. 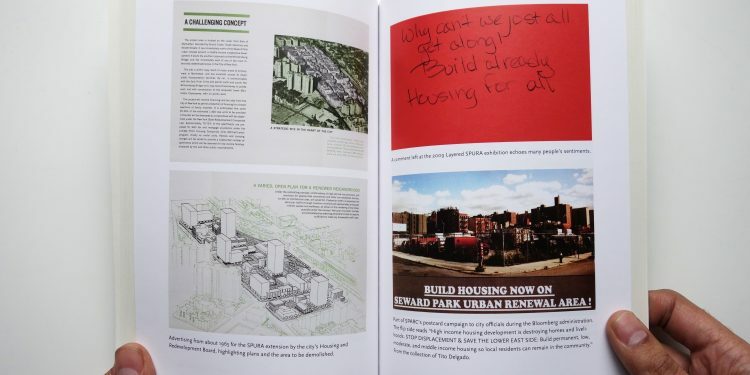 Read an excerpt from Contested City: Art and Public History as Mediation at New York’s Seward Park Urban Renewal Area here. 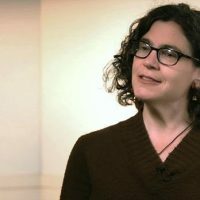 Dr. Gabrielle Bendiner-Viani is an urbanist, curator, and artist pioneering public arts and urban research for community engagement, and is author of Contested City: Art and Public History as Mediation at New York’s Seward Park Urban Renewal Area. She is principal of the design and research studio Buscada and teaches urban studies and public art at The New School. She was the 2017 Post-doctoral Fellow in Visual Culture at the International Center of Photography and holds a PhD in environmental psychology from the Graduate Center, CUNY. She regularly consults with arts and culture organizations on community and art engagements and strategic visioning. Her creative practice has been shown at institutions including MIT, the Brooklyn Public Library, the Center for Architecture, the Sheila C. Johnson Design Center, and Tate Britain. Her work on cities, culture and photography has appeared in journals including Visual Studies, Urban Omnibus, Space and Culture, Society & Space, and Buildings & Landscapes. Julia Foulkes investigates interdisciplinary questions about the arts, urban studies, and history in her research and teaching at The New School. Professor Foulkes’ most recent book, A Place for Us: West Side Story and New York (2016), examines what this legendary musical and film reveal about mid-20th century New York. She has also curated an exhibition marking the 100th birthday of Jerome Robbins that focuses on his relation to New York: “Voice of My City: Jerome Robbins and New York,” on view at New York Public Library for the Performing Arts at Lincoln Center until March 30, 2019.